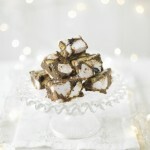 A decadent version of a classic retro dessert given a Christmas twist thanks to the festive spices. Put the gelatin sheets into a bowl of cold water and leave until softened. Stir the jelly crystals into 300ml of boiling water and set aside. In a small bowl add the red wine Ginger, Cinnamon, Orange and Clove Spice Drops® and sugar. Mix until the sugar dissolves. Squeeze the excess water out of the gelatin sheets and put the sheets into a large bowl. Add the wine mixture onto the gelatin sheets then add the jelly mixture, stir well and leave to cool. Arrange the mixed berries and the cake pieces into a large glass serving bowl and pour in enough of the cooled jelly mixture to cover about two-thirds of the bowl, leaving room for the custard and fromage frais. Chill for at least 5 hours or overnight, so that the jelly sets well. In a bowl mix the Cardamom Spice Drops® into the custard and stir well. Spoon the custard over the set jelly, then whisk together the fromage frais and Vanilla Spice Drops® and spoon on top of the custard layer. Take control of Christmas this year and save precious time with Spice Drops® available from Sainsbury’s, Whole Food Markets, Ocado, Amazon and www.holylama.co.uk for £4.00 per bottle (except Saffron).